Whimsical Cake Pops for a Baby Boy! Looking for ideas for a little boy's baby shower? 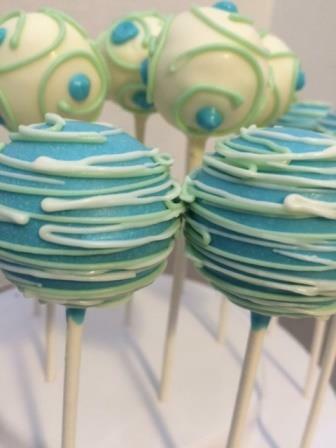 We love these whimsical blue and green cake pops we recently made for just such an occasion. Also available as cake balls, these cake pops will be a hit at any baby shower! We can match any theme or color scheme with our cake ball and cake pop designs. Contact us at info@cakebites.biz to discuss custom cake balls and cake pops for your event!